Have you seen the Christmas comedy classic: National Lampoon's Holiday Vacation? If so, you're sure to remember Clark Griswold's ultra-ambitious Christmas light project for his home. His would be a home that could be seen from space, by golly. 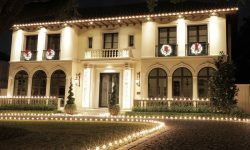 He had strung so many lights on his house that when they were all turned on, the power company had to kick-on the emergency auxiliary nuclear generator to power them! 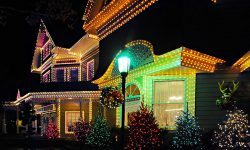 Of course, lots of hilarity ensued from Clark's Christmas light installation antics. But there was one scene that really wasn't at all funny. Instead, it was kind of poignant, even a bit wistful and sad. That was when the movie showed Clark toiling all alone to install his lights, his only companion the brilliant full moon that lit his work. His family, you see, wasn't involved in the project. Clark was alone in his efforts to make his home a delightful and festive oasis of Christmas eye-candy. Kind of sad. And a wasted memory-making opportunity. 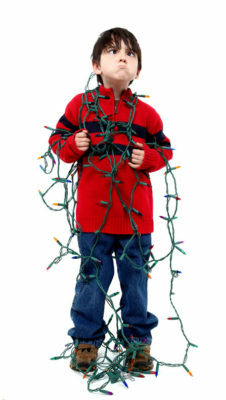 Kids + Christmas Lights = Chaos? 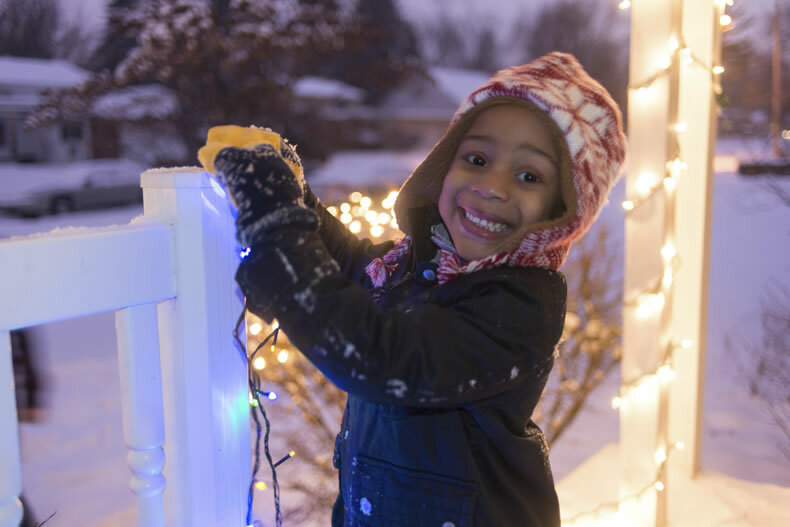 As you dress up your house for this Christmas season, why not get your kids involved? After all, no other group on the face of the planet is more enthusiastic about Christmas than children. 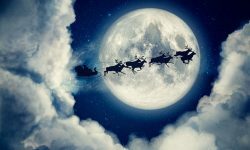 No matter how much adults might love the holiday, there's a special touch of awe and magic to Christmas that each of us outgrows as we leave childhood behind. 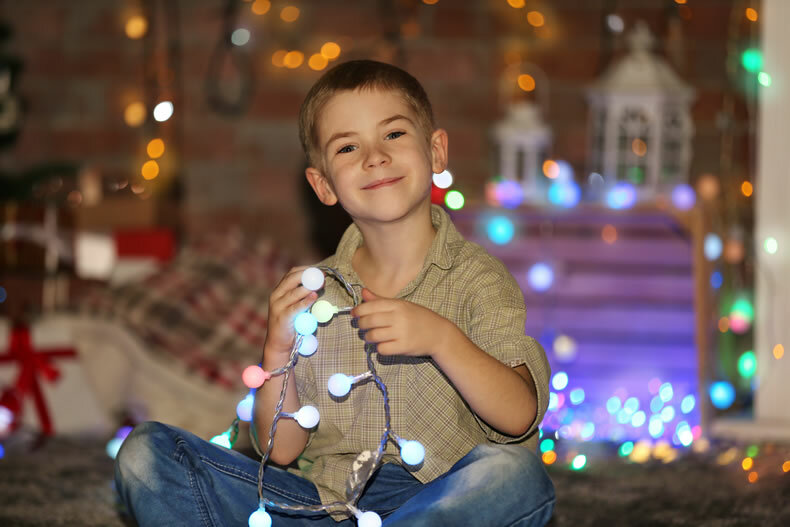 And involving your kids in the pre-Christmas ritual of lighting up your home for the holiday is a great way to ramp up the excitement of the season. Will getting your kids involved with the project be a recipe for chaos? Maybe. But what delightful chaos it will be. And memories will be created that will be cherished for a lifetime. kids, for example, or handling of live electrical wires. But there's plenty that your kids can do to be involved with the project. 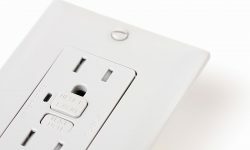 Kids can help screw bulbs into sockets (that aren't plugged in). They can help to untangle light lines that are snarled and tangled from months in storage. 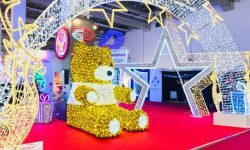 And your kids will be delighted to offer input into the design of your Christmas display: which bulb colors to use where; where to place the Santa figure; where to place the garlands and wreaths. Now in truth, your kids might not really 'help' all that much - at least in the strictest sense of the word. But that doesn't really matter, does it? Every Christmas that comes around offers the opportunity to create memories that will provide a lifetime of fond recollections for every member of the family. Each Christmas, though, provides only the opportunity - for each Christmas is no more than what we make of it. 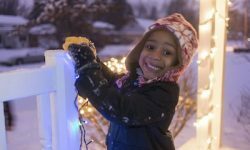 And for many families, getting the kids involved in the yearly Christmas lighting ritual has been an opportunity lost in Christmases past. But Christmases future, beginning with this Christmas, offers fresh new opportunities for memory making. And hopefully, the lonely and sad image of a Dad working all alone at installing the Christmas lights - like poor old Clark Griswold - won't be a snapshot out of your family's album of Christmas memories for this year.